Not since the enactment of HIPPA in 1996 and then Sarbanes-Oxley in 2002 have companies been faced with the most active accounting regulatory period in recent history. These accounting changes are like trying to replace the engine while the airliner is still in flight. Do you want to learn more about how to tackle these key issues of Compliance, Data Security/Governance and Financial Transformation? 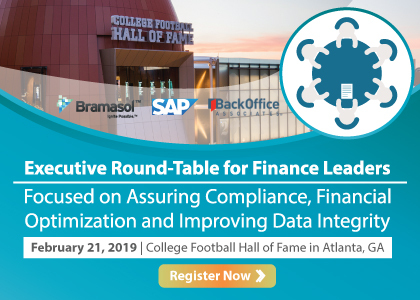 Join leading experts from SAP, Bramasol, and BackOffice Associates, along with a special guest real-world customer presentation, on key topics facing CFOs and financial teams. Also, enjoy the great venue at the College Football Hall of Fame. All attendees will get passes to tour the exhibits, along with a full-day packed with highly relevant information and CPE credit. Click here to get yourself registered to meet Bramasol’s expert.